It wouldn’t be entirely wrong to say that following in the footsteps of the likes of Mahatma Gandhi (for astutely choosing very little to wear), Jawaharlal Nehru, Maulana Azad and Indira Gandhi, Narendra Modi is perhaps one of the few politicians in the modern era who is very particular about the clothes he wears, and, consequently, the image he projects. Like the Gandhi topi and the Nehru jacket, his Modi kurta, with half sleeves and a buttoned-up standing collar, is engendering a mythology all its own. Modi usually wears the kurta with an undershirt and very often teams it with a well fitted Indian style waistcoat. He seems to be equally in love with the long sleeve version of the kurta, but always buttoned up at the neck. Modi might stress on the kurta being a simple, traditional garment, but his choice of accessories speak of a fondness for the good things in life. He wears watches made by the the Swiss luxury brand Movado. His pens are from the German luxury brand Montblanc and his spectacle frames are from the Italian luxury brand Bulgari. 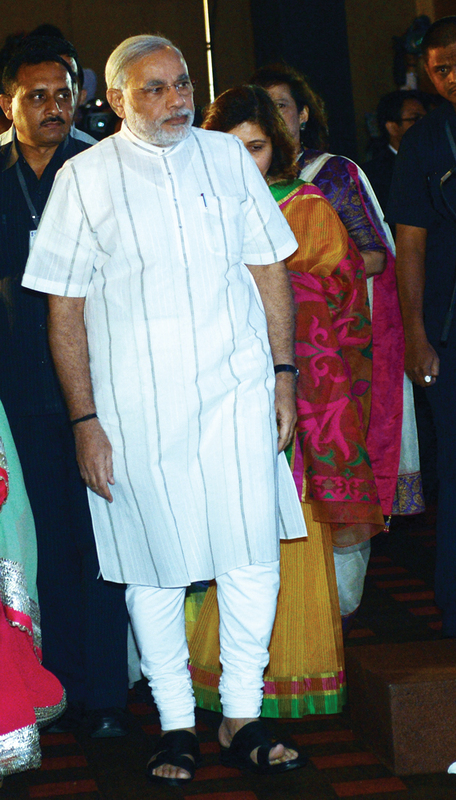 Modi also seem to have a penchant for stylish footwear and sometimes teams up his kurta with expensive looking shawls. Of course very often, he surprises observers by ditching his staple outfits for well cut suits with cravats, t-shirt and jacket, jeans and occasionally in a Texan style hats. The sartorially inclined Modi supporter will be glad to note that, unlike the flashiness his fellow Gujaratis are often are accused of, the BJP prime ministerial candidate is more nuanced. And of course he has also had to reconcile his sartorial choices with the austere ideals of the Hindu nationalist Rashtriya Swayamsevak Sangh which he has been closely associated with all his life. This apparently was not easy. When he was still an upcoming leader, his insistence of being well-groomed and wearing good clothes did not go down well with fellow RSS members. And since we are on the subject of masculinity, does he really have a 56-inch chest? Modi’s repeated references to his broad chest, which echoes the Italian fascist leader Benito Mussolini’s predilection for stripping down to his waist to show off his muscular torso, has consumed acres of print. During the course of writing his book, Nilanjan Mukhopadhyay learnt of Modi’s actual chest size, but he does not reveal it in his book. It is probably a lot less than 56 inches.